There’s nothing better than getting a glimpse at the overwhelming joy brought to a family when they bring home a sweet baby for the first time. From the prep ahead of time, making sure the nursery is just gorgeous, to bringing them home for the first time, it’s such a time to celebrate. We are so thrilled to have Photographer Emily Gerald sharing photos of her new baby niece and the stunning nursery that mom and dad put together for baby’s first big day at home. Scroll on to see photos of this bundle of joy! From the Photographer: There is nothing like watching your brother and his wife-who happens to be one of your very best friends, become parents. I remember finding out that they were expecting and being elated that I would get to document their journey as they became parents. From their maternity session, birth story, and finally their newborn session and nursery, I have loved being able to document these milestones for them and give them a gift almost as precious as the one they gave me-a new niece to love and watch grow! From the Momma: At 20 weeks pregnant, my husband I were thrilled to learn we would be welcoming a little girl into the world! I was ecstatic knowing I had the opportunity to design a special space for our baby girl to grow up in. Surrounded by four blank walls, my husband and I sat in our daughters’ room and mapped out where we planned to place her crib, dresser and rocking chair. From that moment on, our small list of must haves, such as light grey walls, white furniture and per my husband’s request, “mint green accents,” had organically evolved into a soft and feminine garden nursery. I searched Etsy for inspiration and came across The Prints and the Pea’s elegant watercolor paintings. After placing a custom order for three prints, we had the beautiful beginnings of a garden themed nursery for our sweet Evelyn Ann. Ironically, my mother reminded me that I too, as a little girl had a garden themed bedroom with Beatrix Potter’s, Peter the Rabbit décor. Light pink and mint green accents accompanied by bunnies filled the very space I grew up in. Once I realized there was a connection between my childhood room and Evelyn’s nursery, the space we were creating began to take on a much deeper meaning. My mother gifted accents such as the bunny mobile and the Jemima Puddle-Duck figurine that once resided on the shelf in my childhood bedroom. We are proud of the space we created just for Evelyn. Maybe one day, the keepsakes passed down to her nursery will be passed on to her daughter and the generations to follow. This looks so beautiful- I’ve been searching for a good grey paint for my nursery. What paint color did you use? I also love the shade of your grey walls!!! Your daughter’s room looks awesome. Can you tell us the paint brand and color? Please!! love the flowers in the watering can – did you make them yourself? Isn’t that fun?! I am not sure if our feature made these herself. Where can I purchase the flower swaddle? I am actually not sure. =( I saw that Monica from Monica Hibbs had one similar. She may actually know. Fingers crossed! Did you ever find out where the swaddle came from? In love with it! This nursery is truly a dream. Where did you find the lovely mint mirror? Hi Ashleigh! Love your work. Would you mind letting us know what paint color you used for this room? Thank you! Could you share where you purchased that beautiful swaddle blanket from please? thank you! Finn and Olive from Etsy! Hi! Where are the shelves from? Thanks! Do you remember what kind of shelves they are at Ikea? i love them and unfortunately cant find them on Ikea online! What is the wall color of the nursery? Gorgeous!!! Would love to know the paint color on the walls! What color is the wingback chair from Pottery Barn? Everything is beautiful! Thank you so much! Please reach out to our contributor, Emily Gerald and she will be able to answer any interior questions! Swaddle blanket is beautiful. Where is it from? This room is so gorgeous! Can you please share the wall color? I would also love to know the paint color! It’s so soft and subtle! Which color & fabric is the wingback chair? Hi! Your nursery is so beautiful! We are expecting a little girl, and I’d love similar colors in our space. Where did you find the pillows with the subtle white/pink/green colors? I can’t find anything like them online. They were clearance from bed bath and beyond. Sorry for the late reply. Love this! Would love to know the paint color same as other posters! Agreeable grey from sherwin Williams. Sorry for the late response. Hi! I absolutely love your nursery. I am thinking about getting the same chair from Pottery Barn. Do you happen to remember which fabric you picked? I went in and looked at it yesterday and am having a hard tim deciding on which grey fabric I like. Thank you so much! The colors are phenomenal. We too are expecting a little girl and love the feel of this room. Would you share the light grey paint color? Hi, would you mind sharing the paint color please? Ashleigh Ferris can help with this! 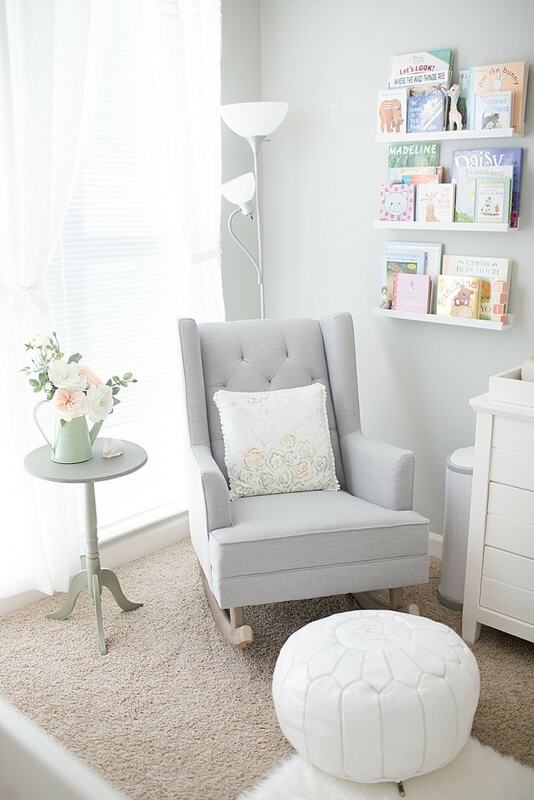 She is the designer of this amazing nursery! So beautiful!!! Our nursery has a similar theme already and gray walls too! Where did you find the flowers for the wall? They really pop, I love them! hi, I asked a question earlier about the little toy on the changing table and you reffered me to Ashley Ferris for that info; do you know how to get in touch with her to find out? Thanks! Of course! You can actually reply to her in the above comment! :) She replied to another inquiry! Sorry for the late response. I guess the inquiries go to my spam. Pottery barn is where the toy is from. I love the cushion!! Where can I get this from? The puff one on the floor? I ordered from a vendor on Amazon! Ashleigh Ferris – I was wondering where you got the changing pad? That style is new to me, and I love it. The nursery is beautiful! Do you mind sharing who so we can order? Thank you! Where is the changing pad from? Where did you get the green watering can? Hi! This is gorgeous! Any chance you can tell me where on Etsy the wall flowers are from? Which shop? I am searching everywhere and can’t find them! Where did you find the mirror over your changing table? SO cute!! Where did the fence mirror come from? Love it!